catchy hooks and killer guitar riffs. The in-your-face vocal will have you singing along. “We wanted to rock out a little harder on this release” say Casuccio. 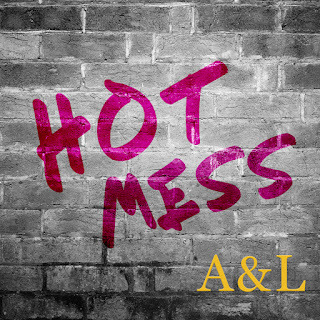 Hot Mess takes a comedic look at the various characters (some unwanted) that you often interact with at a bar or club. We are sure that you will recognize these misfits that Lana sings about. A&L is the melding of Anthony Casuccio and Lana Marie. Anthony is a 20 year music veteran whose production work has been nominated for three Grammy awards, been featured in major music publications and topped the music charts. Lana is an award winning vocalist who has been a long-time force on the WNY music scene and voice to many jingles on radio and television. They have released 2 single to great reviews and charting in Europe with their song Onto the Next Heart. Tell us how the two of you met? What brought you two together to create A&L? Lana: Anthony asked me if I would sing on some jingles that he was producing, I did a few over the past couple years. He wrote our first song Get Me a drink and thought my voice would be great for it. I loved the track and that's how A&L started. Anthony: I knew that Lana had an incredible voice and is a superstar on stage. I thought she would be perfect to collaborate with. Your new single is called "Hot Mess". What inspired you to write the song and what is it about? Anthony: I was working on a track for a band and I heard this amazing drum part. I ended up looping that part and started jamming out the Hot Mess guitar riff and wrote the music. I recently was out and there was some drunken person and I heard someone say “what a hot mess”. I realized we have all seen and been exposed to those crazy people at bars and clubs that we try to avoid. I wrote the first few lines and then the song just came together. Lana and I started rehearsing with a few other players to hone our live show. I brought it in to rehearsal and then it just took on a life of its’ own. We feel that the topic is funny and totally relatable. What do you love most about this single, "Hot Mess"? Lana: It's true and in your face, if you have been to a bar then you have experienced a “hot mess” at least once or the tool who always wants to fight. Anthony: I love that it is so tongue and cheek and that it rocks out a little more than out first two songs. I allowed me to show some of my guitar skills. There seems to be a lot of notable influences in the song from Pat Benatar and to some Twisted Sister. What artists influences your style of music? Lana: You just named one of my favorites; Pat Benatar. I love Pink, Miranda Lambert, Heart and Janis Joplin. Anthony: Probably the Beatles. The Beatles have had a huge influence on my song writing. You can hear it in our harmonies. I master a lot of Rap music so I pay attention to phrasing when I write. What artists do you admire and look up to today? Lana: I look up to those artists mentioned above. They also inspire me when I perform. Anthony: That is a tough question. I love pop music. I like a wide range of artists from Taylor Swift (yes, I will admit that) to Thirty Seconds to Mars. If you guys could share the stage with any major recording artist, who would it be? I bet Lana would love to share the stage with Pat Benatar or Janis Joplin. Anthony: Probably the Beatles, Rush, Triumph or John Mayer. What is the future of A&L? What can fans expect from you during the next year? Lana: We'll definitely more songs and videos for sure and of course some outdoor venues are in the works. Anthony: We are hoping to play some cool shows this summer. We are starting to grow our fan base so playing is the next step.